No chest shots but Vlad looked like he had a good time anyway. Vlad Putin made a historic trip to Tehran this week. Putin blamed technical problems for delays in completing Iran’s first nuclear power plant. 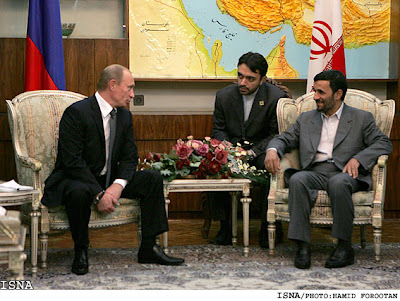 It was a good week in Tehran as the first Russian leader since Stalin visited Iran. The Iranian people have a clear and good image of the Russian nation, he said stressing that such an image comes from resistance and prudence shown by the Russian people at various junctures. On the continuous US threats against Iran during the past three decades since the victory of the 1979 Islamic Revolution, the Supreme Leader stressed that Washington has spared no effort to strike the Iranian nation but its adventurism has backfired. 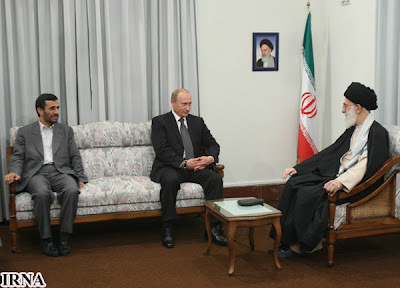 At the end of his meeting with President Putin, the Supreme Leader said, “We will consider your remarks and proposals.” For his part, the Russian president assessed his meeting with President Mahmoud Ahmadinejad as “serious and good” saying that expansion of all-out relations between the two countries particularly in the areas of energy and transportation were reviewed in the compact meeting. The Russian president referred to the prospect of Tehran-Moscow relations as very bright.